Everyone wants to be able to play awesome blues guitar solos and lead parts. This is normal, but sooner or later you are going to play with other people and you will find your entire guitar playing fall to pieces. The reason to why this happens is very simple and comes down to the fact that people’s obsession with blues guitar solos is blinding them for the most important part of playing blues guitar; the rhythm section. In blues guitar playing, the rhythm section of the band is a very important and underestimated part. A tight rhythm guitar along with the drums and bass guitar gives the song a strong groove. 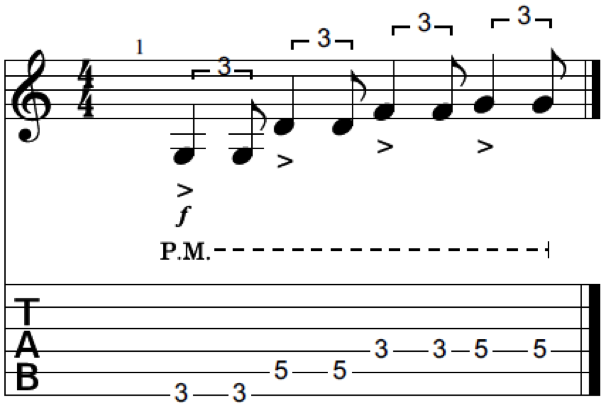 When however one of the rhythm section lacks in tightness (which is the ability to play in perfect synchronization with the other instruments) most of the song’s groove is gone, so for any guitar player it is absolutely crucial to develop a strong and steady shuffle rhythm when playing the blues. Moreover, it can be quite embarrassing if you play guitar at a jam session, in a band, or you want to record yourself, only to find that your rhythm guitar playing is not where it should be. Out of my experience of teaching many hundreds of guitar players over the years I have found that most guitarists describe themselves as being ‘stuck in a rut’ with their guitar playing when they come to me for their first guitar lesson. Chances are, if you’re reading this you might feel the same way about your own guitar playing. It can become quite frustrating to be ‘stuck in a rut’ in your guitar playing progress. But have you considered that the way in which you teach yourself to play might be affected by the insufficiency of the learning and notation systems you use in your practice? When music is being transcribed to tablature, it’s practically impossible to transcribe the right timing and groove of the song, and certainly not in a blues shuffle. 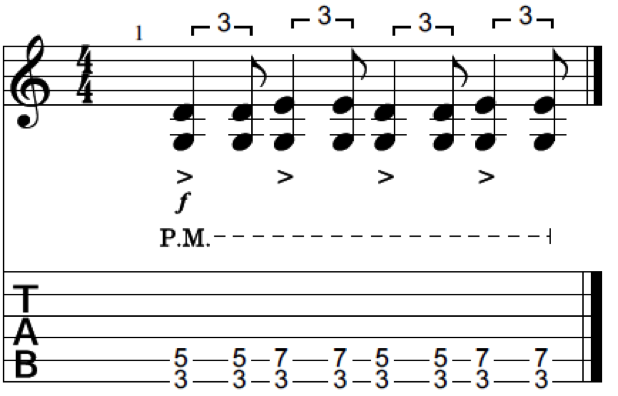 So a lot of crucial information is being omitted in guitar tabs. 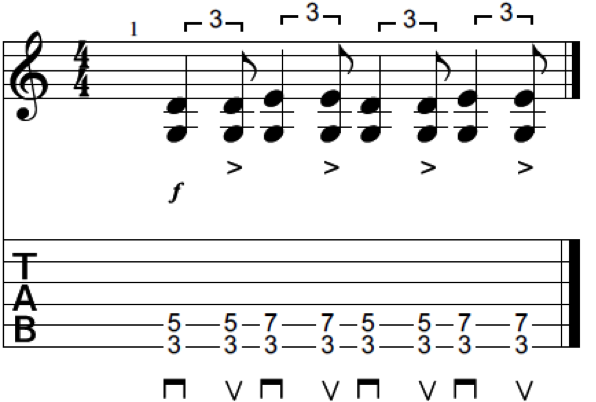 As you will learn in the following examples, shuffles can be played in many variations of timing, so tabs can’t give you the right feel to play the shuffle you want to learn. It’s common for people nowadays to search online for guitar tabs and this is a great thing. But it’s crucial to understand that these tabs can only hold so much information and a lot is being lost in the process of transcribing the music to tabs. The great blues masters didn’t count on tabs in their attempts to learn the instrument. Instead of jumping from one tab to the next, they counted on their ears instead. 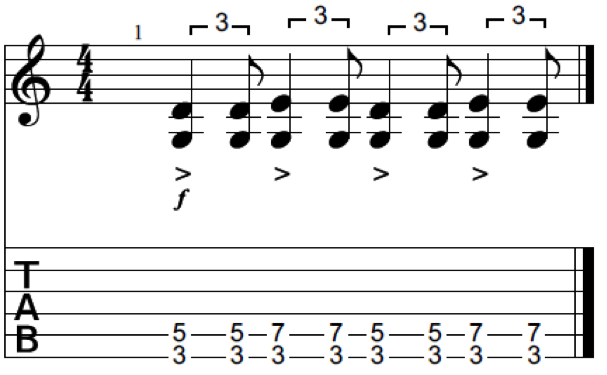 To highlight the examples in this article we will use tablature as a way for you to better understand what is being taught here, so that you can try the examples out yourself. But remember that tablature is just a way to communicate what is being played and in the end it is far more important to listen to the music (that’s why I included several audio examples as well). The shuffle is a specific eighth note rhythmic feel. It is based on triplets rather than dividing the beat in half in a strait eighth note rhythm. In a shuffle rhythm the middle note of the triplet is not played, so the first 2 notes of the triplet are ‘tied’ together, to create that special feel. Besides the shuffle rhythm, we also have a ‘swing’ rhythm. A swing has overall a jazzier edge to it. Think about jazz drummers that lay down the swing groove on their ride cymbal. So it is recommended to always take a good listen to the groove that you’re learning and try to emulate it, rather than using tabs and not concerning about the groove. In most shuffles the first and last notes of the triplet are the only notes being played, but be aware that the articulation of these notes will dramatically impact the feel! The notes can be played as ‘staccato’ (which means the notes are played very briefly and thus cut short) and so the space between the notes is enlarged, this creates a more pushing groove when played tight. 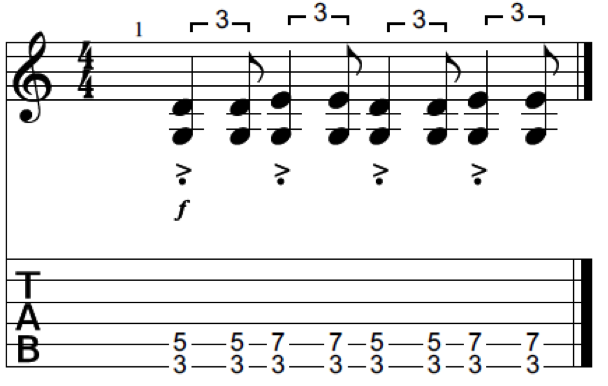 Take a look at the tablature example below and listen to the audio example to get a sense of this staccato shuffle. Or, if you hold down the notes, these notes are more tied together and so the groove gets a little bit smoother. This type of playing is called legato (which means the sound of the notes is very fluent, thus held longer). Adding palm muting to the shuffle also smoothens the groove, and gets the rhythm guitar a bit more in the background to create space for the lead guitar or vocals. All these examples of this basic shuffle are in the key of G. Try to feel the different grooves both shuffles (staccato vs. legato feel) have, because small changes to the rhythm can make great differences in feeling! Another shuffle made famous by various blues guitar players including Stevie Ray Vaughan and Albert Collins is the Texas shuffle (an excellent example of this Texas shuffle would be the song Pride and Joy by Stevie Ray Vaughan). In this recognizable shuffle groove, the third beat of the triplet acts as a strong transition to the next beat. Most of the times, this strongly accented beat is played with an upstroke rake. This particular shuffle involves more fretting hand technique than picking hand technique, as it is useful to mute strings with your fretting hand that are not meant to be played. When doing this, you can fully concentrate on the groove hitting all strings at the time, but just let the right ones ring. To get more familiar with different types of shuffles, play them over a blues backing track, and hear which one sounds the best to you in certain moments. Also experiment with the timing of the notes, some shuffles aren’t perfect triplets, but they might be even played shorter, to create a very pushing rhythm. 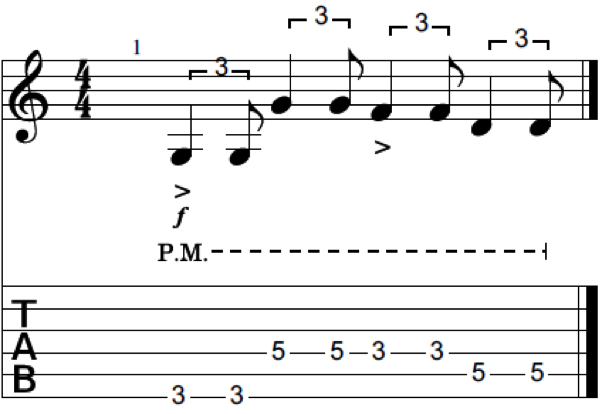 After a while, the basic blues shuffles may tend to sound the same over and over again. However, if you are creative, there are a lot of ways to get a more advanced shuffle rhythm, creating many ways to lay down a nice rhythm groove in a band. To maintain a strong rhythm, it works very well to play some blues bass loops on guitar. They can be heard in many great songs, and lay down a perfect groove in a band. Here are some examples of some loops. Again, try to play them with all the variations seen in “How Articulation Can Dramatically Impact The Feel Of Your Blues Shuffles”, for creating different feels. Both examples can be played over the whole 12 bar, when the progression moves to the IV chord, just play the riff one string higher. On the V chord, the riff is played one string and 2 frets higher. Also try to create patterns and riffs on your own, using notes from the pentatonic blues scale works great for example. Keep in mind that the rhythm section of a band is far more important than the solo guitar and that tabs are only a means to and end, because they can’t tell you the different nuances that different blues feels consist of, which is the most valuable information when learning to play blues guitar. Learn how to play Blues Rhythm Guitar like the blues masters with this free downloadable ebook.